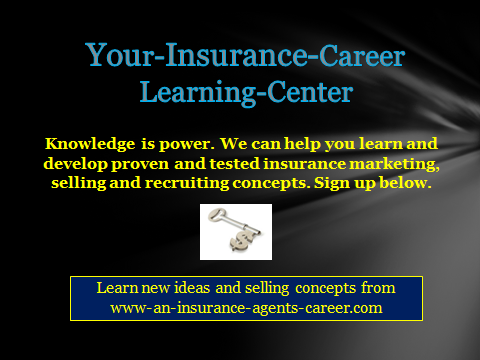 Insurance Career On Line Learning Center. selling, prospecting or recruiting problem. Our insurance career learning center now provides a way to help you fix your problem. We do this by providing you with one on one personalized coaching help. On - Line Learning Center training programs? The number one reason is that you will get personalized one on one help from someone who has already successfully walked the path you are now walking. You have the opportunity to have someone help you not make the same mistakes that others continue to make over and over again, and then end up failing. we can provide you with some powerful one on one personal coaching to try and help you work through any prospecting, selling, closing, marketing problems that you may have. and are having problems with recruiting, training and building an agency, we can help you develop the needed systems that will help you expand, based on a proven and tested success formula. of written one on one communications, video help and allow you to respond back with any and all personalized questions related to your situation. We may also ask that you sign up for the Skype program or use a similar program such as google video. Skype is a no cost program to you. It would then allow us to work via an actual one on one video connection, a sort of mini video school. If you do not have a camera on your computer, you can still hook into any coaching session via the Skype audio link. Click on this Skype Site Page and then click on the "join here button" on right side of the Skype page for a quick overview of how it works. If Skype is not an option, then we will find a suitable communication option. Please note: When you enroll in any of the training/coaching programs, we will be sending you a password. You will need this password to open up your training page. If you have any questions about any of these training programs please feel free to contact me. 103-Wow. I can use help in both areas shown above. 104-Agency Building and Recruiting. Learn How. If you are an agency manager or an agent starting to build a life insurance agency or P&C agency, this coaching program was created to assist you in the development of a step by step fast start program to help you develop your long term action plan and walk with you through the steps needed to build your agency. It comes with a complete agency building manual , that has everything you need to recruit and train new agents, as well as a free membership into the insurance recruiters roundtable. Initial set up fee and minimum of three (3) hours consulting is only $310 then $80 per hour after that. You are only charged for actual time we spend helping you. Because we are looking at helping you build your own agency, each situation and each manager will have to have their own unique tailor made program. This agency building and recruiting -104 coaching program comes with a complete agency building manual, (a $189 value) that has everything you need to recruit, interview and train new agents, as well as a free membership into the insurance recruiters roundtable. Program - 104" read this. You will need to complete this personal analysis questionnaire. This tells us a little bit about you, and helps us determine where you are in relation to your insurance experience to start building an agency. We will need this information to determine our starting point and identify what you want to accomplish, as well as your target market. Building your own agency does require a long term commitment and requires patience. It does not happen overnight. It also requires a capital investment on your part as you move forward. Understand you are now looking at building your own business. There will be marketing costs, printing costs, possible office expenses, training and development cost. Plus this is like starting another part time job on top of what you are now doing. In today's world, it is also important that you have the proper social media marketing programs in place to maximize your effectiveness. This should include your own personal website, Facebook account, twitter account, LinkedIn, etc. We do provide free consulting that explains how all this can help you.